Cabbage with large, curly dark green leaves. Scientific name is Brassica oleraceavar acephala. Many people don’t even know what the plant looks like, all they ever see is the frozen or chopped cellophaned version. According to TOCF, kale was the ordinary greenstuff for country people until the late Middle Ages, when the headed cabbages gained popularity. 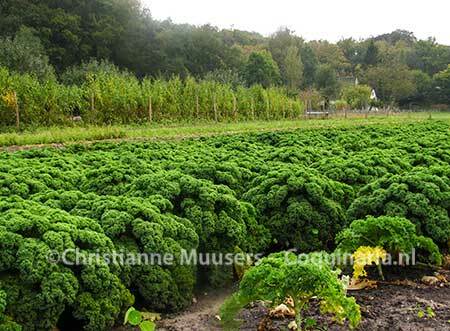 Kale was very valuable because of its resistence to frost. In the depth of winter, when all land was bare, you could still harvest kale. Recipe: Stamppot with potatoes and kale. This beverage is traditionally made from fermented rye bread. It reminds one of cola: the colour is dark, it is carbonated and sweet. The taste is refreshing, and considering that beer is also made from fermented grain, it is not so strange to drink this ‘bread-beverage’. 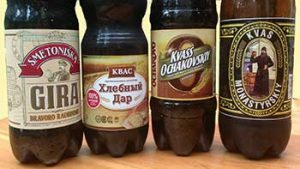 Kvass can be bought in Russian or Polish (or other East-European) stores. It also possible to make kvass at home, but I haven’t tried that yet. This recipe seems doable. Recipe: Cold Polish soup from Russia.